Where talent and inspiration meet. If you want to nurture your artistic talent, William Woods University provides the canvas for you to paint your future. 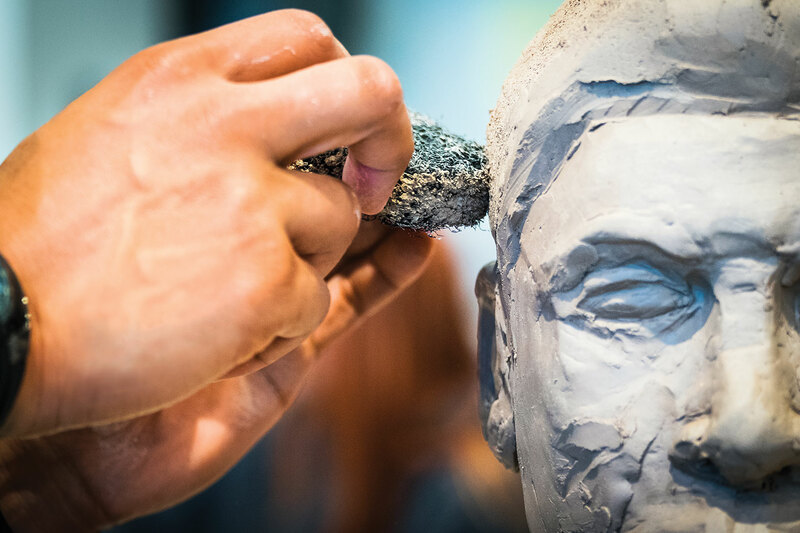 We offer fine arts majors in art, graphic design, studio art and theatre, with extracurricular learning opportunities that will give you hands-on experience not just in creating work, but in producing, marketing and performing as well. In other words, we provide the tools and coaching you need to make a living through your talent. The William Woods University campus is rich in studios and facilities for production of graphic arts, digital productions and theatre. In addition, we offer a variety of venues and opportunities for performance, exhibition and experience that you wouldn’t expect in a university our size. Bring your talent to William Woods University. There are so many ways for it to flourish. For over 30 years, William Woods University has had close connections with iconic performers, directors, writers and leaders, providing unparalleled experiences and unique opportunities for students in the arts. William Shatner, successful director, writer, actor and producer. Perhaps best known for his roles as “Captain James T. Kirk” of the Starship Enterprise and his Emmy Award winning turn as lawyer “Denny Crane” on Boston Legal, William Shatner is also an accomplished horseman/philathropist who shared his experiences as guest instructor to the Equestrian program at William Woods University. Additionally, Shatner served as commencement speaker and has donated several horses — including one of his championship winners, Revelwood’s Jacks are Wild — to the university. Mike Farrell, noted actor and human rights activist who starred as “Captain B.J. Hunnicut” in the acclaimed TV show M*A*S*H visits the William Woods University campus to spend an evening with more than 800 students, faculty and staff. Wayne Newton, one of its most popular performers and known as “Mr. Las Vegas.” Invited by Board of Trustees member and longtime friend, Melvin Hall, Newton donated his services providing a Christmas concert to help raise money for the Mrs. Melvin G. Hall Scholarship Fund at William Woods University. He also received an honorary doctorate degree in music from the university. John Williams, considered “America’s Composer,” the former Boston Pops Symphony conductor is an Academy Award winning composer of numerous film scores, including the Harry Potter films, Star Wars, the Indiana Jones trilogy, Superman, Jurassic Park and many others. Ronald Reagan, before his election to President of the United States, he visited William Woods as commencement speaker. The commencement address from that appearance is considered to be “one of the oldest surviving speeches by Reagan” by the American Experience history series. William Woods University fine arts alumni are working in creative and management positions, as well as pursuing successful freelance careers in their professions. Some of our alumni have gone on to receive their MFA to teach college level arts, or combined their bachelor’s degree with non-arts degrees, giving them the opportunity to pursue a career in teaching, public relations, marketing and adding creativity to business teams, and so much more. William Woods provides a safe environment that challenges its students to attain their chosen dream. Opportunities for self-expression are always available for those students who take the initiative and have the drive to make things happen. The professors really cared about the students. This program helped me grow as an artist. — Jennifer Costello, B.S. in Studio Art, ‘07, founder and owner of Arctic Cards, LLC, St. Louis, Mo. My professors truly cared about my development as a professional designer and fine artist. — Holly Dirnberger, B.A. in Graphic Design, ‘05, designer and illustrator for Red Letter Communications, Inc., Cape Girardeau, Mo. Perfect your technique and foster your talent for a career that brings creativity to businesses, marketing and public relations firms and other institutions. Get your hands on the tools that can be used to mold your dreams through drawing, painting, sculpting, building, and through simply creating. Get inspired and gain an understanding of the history and foundational elements of Art. Become an expert in the area where your passion flourishes. Explore all aspects of theatrical production from acting to directing to stage management while being immersed in famous theatrical literature and history.